3,400 – Seating capacity of the Kodak Theater.It’s actually 3,401 but they’re keeping a seat empty in case Angelina Jolie bears another child during the ceremony. 14 – Most nominations received by any film. (All About Eve in 1950 and Titanic in 1997). 1 – Number of American women nominated for Best Director (Sofia Ford Coppolla for Lost in Translation). 500 – Amount of dollars you could win in our Oscars contest. 25/1 – Posted odds of Angelina Jolie winning for Best Actress. 90/1 – My made up odds of Angelina Jolie and Jennifer Aniston scrapping in the bathroom during tomorrow night’s ceremony. 19 – Number of times Bob Hope hosted the awards, which is a record. 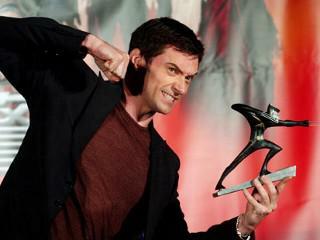 This year Hugh Jackman hosts for his first time. Several Hundred Million – Number of viewers who watch the Oscars, worldwide. 95 – Number of photographers on the red carpet at least year’s show.